WTI oil accelerated higher after US weekly crude stocks data showed much stronger than expected fall in oil inventories. Weekly stocks fell by 5.29 million barrels, vs 1.3 million barrels draw forecasted and also overshot previous week’s 4.3 million barrels fall. This comes as additional supportive factor for oil prices, already boosted by fears on potential impact of hurricane, as well as rising concerns about looming US sanctions on Iran. 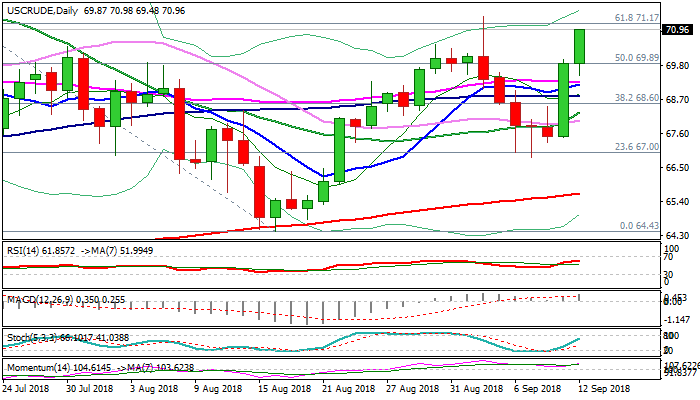 Oil price is on track for close above broken psychological $70 barrier which would open way towards key barriers at $71.17/38 (Fibo 61.8% of $75.34/$64.43 fall / 04 Sep high).